Somerset Parkside emerged as part of an ambitious plan to revitalize a city neighborhood in downtown Sacramento. Encompassing a full city block, it is a mixed-use, mixed-income, self-sufficient community. Each of the 107 dwellings has a private yard and a south-facing balcony, while compact units and low construction costs yield affordable prices. Its strategic design guarantees each building year round solar access, allowing for the use of passive solar heating and cooling methods. Within this quiet pedestrian community, the reduced need for transit reduces auto dependency. A centrally located canopy of trees fully integrates the landscape, providing respite from the high density housing. This award-winning 100-unit housing project was completed for a construction cost of $6.2 million. This innovative housing project was nationally renowned for its lively mix of affordable and market rate housing, commercial space, shared gardens and recreation areas and wonderful outdoor spaces. The design incorporates the innovative use of low cost construction materials, compact design, place sensitive site planning and energy efficiency to help transform the downtown of California’s capital city into a vital pedestrian community inhabited 24 hours a day. The site planning was crucial to the success of Somerset Parkside. Keeping the parking at the perimeter opened up half the site for lawns, paths and private yards. Almost all the residential units look out onto trees or shrubs. In addition, all the units have a private yard or balcony facing south and year round solar access. 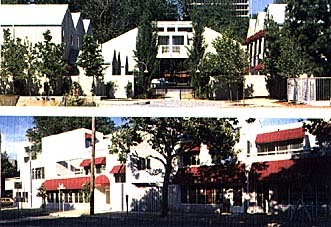 A variety of housing types and scales are used to match the diversity in the neighborhood. On the northern edge there are three-and-a-half story apartments to relate to the facing office buildings, and on the southern edge the structures reflect the scale of the old Victorian houses on that street.